Capt. Fred Sharpsteen probably went to his grave lamenting that he could not do more to save his family and the lives of three others who died the day his ship, the schooner Hunter Savidge capsized and sank on Lake Huron. The Savidge still rests in about 200 feet of water, just off Grindstone City on the tip of Michigan's Thumb District. It is a tomb because it still contains the remains of Captain Sharpsteen's wife, Rosa, and their son, John, 16, making what may have been his first voyage as a deck hand. Also trapped in the wreck were Mary Muellerweiss, wife of the boat's owner, Alpena businessman John Muellerweiss, and their six-year-old daughter, Etta. The ship's first mate, Tom Duby, drowned. The women were traveling as guests of the captain on what was to have been a pleasant summer trip from Alpena to Cleveland and back again. 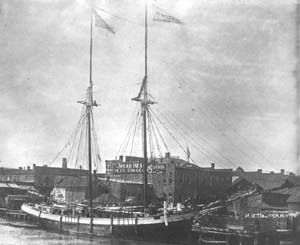 The schooner brought a load of coal to a buyer in Sarnia, Ontario, and was sailing empty to Alpena when the wind died. The date was Sunday, Aug. 20, 1899. It was one of those hot, sticky summer days when sweat beaded up on a man's face while he was standing still. The Hunter Savidge stood for hours, becalmed, just off the Michigan coast. Every sail was set in the hope of catching the slightest puff of wind. The boat was caught by an unexpected, fast-moving squall that swept down on the Savidge so fast the crew did not have time to reef the yards and yards of sail. As the storm bore down on them, Sharpsteen called all hands to the deck and mistakenly sent the women and children below to a cabin where he thought they would be safe. The wind struck with such force it immediately tipped the vessel on its beam ends. The Savidge rolled completely over so that it floated upside down. The crew members were thrown into the water but most managed to swim to the surface and grab the sides of the overturned wreck. Duby and John Sharpsteen, however, were drowned. John was wearing heavy boots. Although he made it briefly to the surface he yelled out to his father that they were pulling him down. Fred Sharpsteen said he was just a few feet away when the boy went under. He was not seen again. The two women and little Etta Muellerweiss were trapped below deck in a cabin that became their tomb. The only way for them to have escaped was to have swum down a stairway to the deck, which was now at the bottom of the ship. The sailors were in the water only about 20 minutes before the steamer Alex McVittie came upon the wreck and picked up survivors. Captain Sharpsteen reportedly asked the captain of the McVittie to take his boat in tow, but his request was denied. Instead, the McVittie, which was steaming north, put the crew of the Savidge aboard the southbound vessel, N. E. Runnels, which took them to nearby Sand Beach, the old name for Harbor Beach. There, Sharpsteen hired a tug, the Frank W to take him back to the wreck. The Savidge was never seen again. The boat sank with its precious cargo still aboard. The Sharpsteins were natives of Sebewaing, Michigan. Members of the family still live there today.